NonProfit Spotlight: Make-A-Wish Western NY | Rochester Young Professionals, Inc. Since it’s inception in 2003, Rochester Young Professionals has been dedicated to doing and supporting those who do good in the Rochester community. Why? Because we love this city. For the next series of blogs, we’re shining a light on local organizations who are furthering social causes that directly impact the lives of our neighbors, friends, and community members. This week, we had the opportunity to speak with Katherine Marsh, Administrative Coordinator at Make-A-Wish Western NY, an organization that grants the wishes of children with critical illnesses. You can make a difference by joining RYP in representing Make-A-Wish at Park Ave Fest this Sunday, August 5. For those who may not know, tell us a little bit about your organization. Make-A-Wish – together with medical professionals, our constituents, corporate sponsors, volunteers and community members – creates life-changing wishes for children with critical illnesses. Make-A-Wish was founded in 1980, when 7 year- old Chris Greicius was granted his wish to become a police officer by members of the Arizona Department of Public Safety. The Western NY Chapter was founded in 1993, with the office in Rochester, NY opening in 2011. Our office, with a total staff of three, works closely with the regional team and our amazing volunteers to cover our designated 9 counties, including Chemung, Livingston, Monroe, Ontario, Schuyler, Seneca, Steuben, Wayne, and Yates. The Rochester office has more than 120 volunteers, not including those who live in the Southern Tier. Right now, we are hoping to diversify our pool of volunteers in the Southern Tier region and in the City of Rochester. What’s something you wish the community knew about your organization that they may not know? Many are under the impression that we grant wishes to children with terminal illnesses only; In fact, we grant wishes to children who must live with life-threatening illnesses. This means we look to grant the wishes of children and their families living with the myriad stresses of ongoing doctor visits, medical tests and interventions, as well as the attendant uncertainties of such a day-to day struggle. We create wishes because wishes have proven medical and emotional benefits that can give children with critical illnesses a higher chance of survival. When a wish is granted, a child replaces fear with confidence, sadness with joy, and anxiety with hope. Every 34 minutes Make-A-Wish grants a wish to a child fighting a critical illness, but there is a tremendous difference between the number of wishes we grant and the number of wishes we need to grant. What’s currently on your organizations wish list? The gifts of time and money are crucial for those battling critical illnesses. 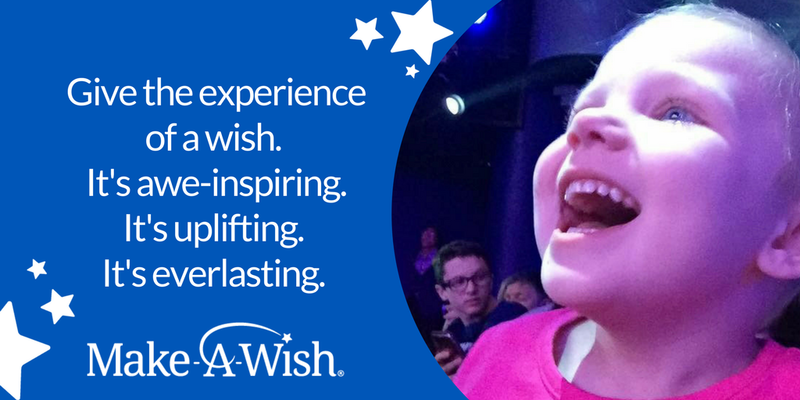 In our area, the average cost of a wish is approximately $10,000, and only one-third of the children in our community who are diagnosed with a critical illness get to experience a wish. Because we grant a great many wishes that involve travel – the wish to go to another place, another realm – we welcome donations of frequent flyer miles. Many of the wish families must invest all their resources in medical care. The children are often limited in their physical activity, so we are always seeking gift cards, which can be a fantastic way to allow them to identify their own wants and needs and empower them to attain what they choose. Another important donation item is luggage; To make the travel wish special and stress-free we like to provide these families with nice, new appropriate luggage that enables them to travel with ease. In general, luggage with sturdy wheels and children’s characters are most welcome. Children’s backpacks are great, too! What is the impact a donation makes on the people you serve? Even a small contribution can transform the life of a child with a critical illness; the very idea of living a life viewed as “different” and feeling alienated or ostracized by medical conditions can be changed by a simple act of consideration and the connection it creates. This is most evident in working with our local schools through our Kids for Wish Kids fundraisers; To be recognized is to be humanized, to be included and valued is restorative and creates a greater sense of support and community. It may sound overly sentimental, but each little act of kindness is a win-win. Just this morning I received a call from a woman who was unable to use her concert tickets and wanted to donate them to a wish child; imagine getting that phone call and being offered tickets to see Taylor Swift in Toronto! Every wish child and wish family I have met has been so remarkably grateful for their experience, and those who have given embrace that connection and their power to help change the lives of others! How can young professionals get involved? Young professionals can support Make-A-Wish in a range of ways: attend our fundraising events; create their own fundraiser within their network, organization, or company; host a luggage drive or collect gift cards to donate. Also, as mentioned, we need volunteers who are willing and able to work with families in the City of Rochester or throughout the Southern Tier.